Q How common is fungal infection of the ﬁngernails and what is the best treatment? A The overall prevalence of fungal nail infections is about 6-8% in UK. Fungal infections of the fingernails are less common than toenail infections. If just one fingernail is affected, it is likely to be a dermatophyte infection, but it is always worth considering spread from a fungal infection on the feet. Fingernail infections are more likely to occur if the nail is abnormal or damaged. If there is associated swelling of the proximal nail fold, then the problem is likely to be candidal. For dermatophyte infections, treatment with terbinafine 250mg/day for 2 months or itraconazole (100mg daily for 2 months or as a pulsed regime: 200mg bd for 7 days, repeated after 3 weeks) can be used, and is very well tolerated. In candidal nail infection, itraconazole is preferred. Q What is the recommended treatment regime for tinea capitis in children? A This depends on the likely pathogen. Over the last 20 years Trichophyton tonsurans has replaced microsporum infections as the most prevalent cause of tinea capitis in urban areas. In rural areas, infection is more likely to from an animal source, e.g. cattle ringworm. Sporadic cases of M. canis from puppies and kittens are still occasionally seen, but are relatively rare now. National guidelines recommend terbinafine once daily for 4 weeks for trichophyton infections. 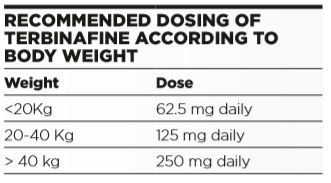 Terbinafine is not available in a liquid form, but tablets can be halved or quartered as required to achieve the correct dose, according to weight (see below) and are well tolerated in children. Alternatively, itraconazole 5mg/kg/day for 4 weeks can be used. It has the advantage of being available in liquid form, but is more expensive. Griseofulvin can still be used, and may be preferred as more efficacious in microsporum infections, but has to be given at higher doses and for longer periods in trichophyton infections, and is associated with more side effects. Q What are the key considerations when diagnosing skin fungal infections clinically in primary care? A It is always best to try and confirm the diagnosis in the laboratory with appropriate fungal scrapings. Topical treatment will often suffice in skin infections, but when the hair or nails are involved, oral therapy is almost always required. Overall, it is better to avoid combination antifungal/topical steroid preparations in an attempt to hedge your bets. Topical steroids are permissive in dermatophyte infection and have no part to play in treatment of the inflammation. Q Under what circumstances should we take fungal scrapings from a rash we think clinically is a fungal infection? A It is always preferable to take fungal scrapings and confirm the diagnosis, but it is imperative to do so if there is diagnostic doubt. Occasionally, it may be justified to give a trial of topical treatment for very localised tinea corporis, but the diagnosis should be reconsidered if there has been no improvement after two weeks. Q In the case of acute paronychia should we prescribe topical or oral treatment, or both? A Acute paronychia may be bacterial, in which case the finger will be hot, red and painful, and oral antibiotics will be required. In more chronic cases, especially if several nails are involved, candida is more likely to be responsible. In such cases, good results may be achieved by keeping the hand dry and treating with potent topical steroids to reduce the swelling and restore the cuticle. However, oral itraconazole may be required, especially if multiple nails are involved. Q How long is treatment usually needed for Tinea pedis/corporis/cruris if using antifungal cream or if using tablets? A Tinea pedis (without onychomycosis), corporis and cruris should clear with two weeks of appropriate topical treatment. If not, then it is worth reconsidering the diagnosis and taking formal fungal scrapings. In recalcitrant or recurrent infections, two weeks of oral therapy may be required, but this is unusual, and the diagnosis should always be confirmed mycologically in these circumstances. Most ringworm at these sites is due to T. rubrum. However, if an adult is shown to have tinea corporis due to T. tonsurans, they will have acquired this from contact with a child with scalp ringworm, so look (and treat) the source. Q Under what circumstances should we treat pityriasis versicolor, and how should the condition be managed? A Localised infections may be self-limiting, but I would always treat extensive infection (i.e. with more than 50% of the torso affected). Usually an antifungal shampoo (Selsun or 2% ketoconazole) used as a body wash, left on for five minutes and then rinsed off, will suffice, but 2% ketoconazole cream or if very severe, 2 weeks of itraconazole 100mg bd can also be used. Recurrent infection is more likely if the patient is immunosuppressed, diabetic or alcoholic or in individuals who exercise regularly, and so get repeatedly hot and sweaty. Q Fungal toenail infections are very common. Which groups of patients would you suggest particularly beneﬁt from treatment and how long will it be needed? A Nail infections are best treated with oral antifungal agents unless there is a potential interaction with other drug therapy that limits use. Dystrophic nails act as a potential portal of entry for bacteria, and can therefore predispose to cellulitis, so should always be treated in high risk patients, such as diabetics. However, toenails grow slowly, especially in the elderly, so although the fungus may be treated, the nails may still look very abnormal, as it takes many months for the damaged nail to grow out. Topical therapy, such as nail lacquers, can have a limited place in some situations (e.g. limited disease or patients on other systemic therapies that may interact with oral antifungals). There is a trend towards laser therapy, but standard oral antifungal therapy remains the gold standard. A three month course of terbinafine or itraconazole is standard. Patients from tropical countries may have an endemic mould infection, rather than a dermatophyte onychomycosis. Although not seen outside of urban areas with high levels of immigration, mould infections, such as Hendersonula, cause very abnormal nails but cannot be treated by any existing antifungal agents. Consider a mould infection in cases when nails are very abnormal but standard mycology is negative. Specialised laboratory techniques may be required to confirm a mould infection.